"The iPhone and iPod Touch have revolutionized both the gameplay and game‐making experience," Young said in a statement. Apple announced last week that more than 30m iPhones (and iPod Touch devices) have been sold life to date. Compared to portable gaming devices, that ranks the iPhone platform a fast climbing third behind Sony’s Playstation Portable (50m units sold worldwide since December 2004) or Nintendo’s 96 million DS units (also available since 2004). The addressable market and installed base is substantial, and growing. Already users have downloaded more than 800 million applications since July when the “App Store” opened and by rough estimates, more than a quarter of the titles in the store are games. Ngmoco was founded with the goal of contributing high quality titles to that mix. The company’s first releases debuted in October. Since, the catalog has ramped to seven titles. Five of these seven have reached Apple’s list of top ten iPhone games. So far, Ngmoco’s games have been installed more than 7million times. The company plans to add as many as fifteen more titles this year. As part of the new Series B financing, Norwest partner Tim Chang will join Ngmoco’s board of directors. Kleiner Perkins partner, and former EA Chief Creative Officer , Bing Gordon already sits on the board as a representative for the company’s Series A investors. 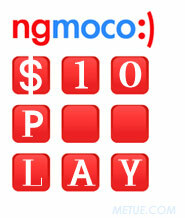 Ng:moco was formed in June, 2008. The company raised $5m in a Series A round last August.